Blog — What Were Comics? We are getting spectacularly close to having a complete set of all the books in our corpus (indeed, I’m expecting a FedEx shipment with some of the final books to arrive either today or tomorrow). But there’s a big caveat: I think we’re getting close. As I mentioned to Ben a couple of weeks ago, we have to anticipate a certain number of mistakes that will necessitate re-purchasing. Due to the constant renumbering and relaunching of series, and the migration of titles between publishers, errors have crept in to our buying. Not a ton of them, but enough to be annoying. Fortunately, they haven’t been too expensive, and I was even able to trade a number of the comics that were purchased in error for credit on one of our costliest titles. I do, nonetheless, live with a certain kind of fear about mistakes in purchasing - or, worse, mistakes in our sampling frame itself. This morning kicked out one of the latter. That evinced a little panic. It didn’t seem plausible to me, because I remember the history of the launch of these titles and the founding of Image, and I couldn’t imagine that Kubert had taken over the title by February 1992. When I looked at the front cover things got worse. That 1962-1992 Spider-man box seemed to confirm that I’d bought the wrong X-Men #17. Plausible, because if you type “X-Men 17” into the search bar at MyComicShop you get a couple of dozen hits. However, their database claims that this issue is from 1993 - contrary to the front cover and the indicia. I began to think that they had to have it wrong down there in Texas. So I looked at the GCD - where there’s an even greater number of X-Men #17s due to international editions. They too say that this is from 1993. They couldn’t both be wrong, surely? Finally, the Standard Catalogue noted that it was cover-dated February 1993 but that the indicia was wrong. So, we’re using all four sources to determine that the comic book is wrong about the comic book. Facts are funny things in the history of this industry. Okay, this one is genuinely troubling from a coding perspective. Our copy of this book has 76 pages. The problem is that 48 of these appear twice. The last 24 pages of this books seem to have been included twice. The GCD reports this as 52-page comic book, and, indeed, aligns with exactly what we have here, except that we have some of it twice. I would call this an error and disregard the second 24 pages except for the fact that this is a squarebound comic and all of the binding looks exactly aligned, as if it was supposed to be a 76-page comic (which would make sense, as it is a special edition centennial thingy). So, we’re filing this under “I don’t know”. The writers of the stories here, by the way, are Warren Ellis, Alan Moore, and James Robinson. So little seems to have been written in the scholarship about the overlap of Vertigo and Harris Comics…. Strange one. This is the final issue of this series, part of DC’s late-1990s abortive Helix line, their attempt to do for science-fiction what Vertigo had successfully done for fantasy earlier in the decade. There is nothing noteworthy at first glance about this comic, except that our copy has the pages printed out of order. For a second, I even considered that it might’ve been done deliberately. I just checked around, and it doesn’t seem to be a commonly reported incident, so I’m guessing that it is just this copy that is messed up, rather than the complete print run. According to the numbers at Chomichron, this issue sold only 5,669 copies. Even with these sad sales numbers, this title was one of the more successful books in the Helix imprint - only four titles made it to a twelfth issue (the most successful, obviously, was Transmetropolitan, which was shifted to Vertigo when Helix folded). I’m not sure that the misprinting actually affects our coding of the book, so we probably won’t bother to replace it. Marvel Selects was a pair of strange series published in 2000, one title dedicated to Spider-man and one to the Fantastic Four. The comics featured reprints of stories from the 1970s, which was not exactly the peak material in the runs of these characters. Both series ran only six issues, so it doesn’t seem like the idea was a success. What is weird, though, is that this comic features ads that are not ads. Our coding protocol addresses three types of ads: external ads that are sold to some company that is not the publisher (a film studio, a video game company, a food company); in-house ads that advertise other products from the publisher itself (subscriptions, other forthcoming titles, trade paperbacks), and public service announcements. What it doesn’t count are what this book has: reproductions of ads that ran in the original comic book that are marked at the bottom as no longer valid. That is to say, they are ads for companies that no longer exist. We have a category for editorial content, and the little notices on the bottom seem like that could make them qualify, but it’s not really what we mean by that term. We have a category for activities like puzzles, but that also doesn’t seem to fit. We have one for title pages, but that’s a no. There are two categories that seem close. The first is pin-ups, which are images meant to stand alone outside of a narrative, which these do. The other is behind-the-scenes material. If we would want to make a case that the comic is being meta-reflexive about its own publishing history (which, to be fair, it actually is!) then this category might bend enough to accommodate these pieces. Frankly, I’m not sure where I fall on this question yet, though I lean towards pin-up. If you have an opinion, we’re all ears. There is, of course, always the dreaded “other”, but we’d prefer not to have to do that…. With the return of the school year, we've started back on the process of coding our corpus. Right now we are doing a second run through all of our comics, focussing on paratexts (ads, letter pages, recap pages, credit pages) with a secondary focus on story length - which will set us up nicely for our third pass, which will focus on stories themselves. Combining these two elements, of course, also gives us comic book length as well. We've started with the most recent comic books and are moving backward in time. This means that the majority of our count so far has been 32 and 36-page comic books, with occasional forays into 52 pages and a very few 28-page books (plus one 200-page Jughead Digest!). The way that we're doing this now is crunching all of this by hand on index cards that are then inserted into the bag along with the comic book. We will add all of the information from the cards into the database as a second set, but we've already found that it is much faster to count and then record than it is to try to do it all at once (mostly because of tabbing backwards and forwards through the computer program). Also, the index cards give us a fallback if something catastrophic happens to our database. For the most part, at least with contemporary comic books, the process of counting ads and story pages is very fast. I can do a regular comic book in about ninety seconds as a series of shorthand notations (c for cover, in for internal or house ad, ex for external ad, LC for letters page, and so on). Most elements in contemporary comics are full-page (I think I have only encountered one comic book with half-page ads so far). The somewhat less rare double-page elements get recorded as "in+in" or "ex+ex" to show them as one element across two pages. Again, this is all very quick. Once the notes are on the pages, I do a quick double-check by adding the number of story pages with the number of paratext pages. This gives me a number divisible by four, and I know that I'm set. If it does not, I have to go through the comic book again to figure out where I made my error. So imagine my frustration with #3462 (Suicide Squad #19), our first 38-page comic book. How 38, you ask? Good question. As you can see above, Suicide Squad #19 has a gatefold cover, with the right hand portion tucked under the front cover. The reverse of these two pages is a house ad with a double-page spread. At first I counted this as a cover and an internal ad, but that seemed wrong. I thought that it was all just one cover, no matter how large, and so shouldn't be counted twice. But that made no sense, because in reality we're counting four pages on each piece of paper, but they are, of course, only one piece of paper. Then I circled the "c" to come back to it, but that made no sense either. So then I changed it to "c+c" and "in+in" to reflect the double-page spreads and allowed the final page count to stand at a non-standard count. So, the first exception to our rule of four. See that beautiful image up there? Yeah, well our copy looks nothing like that. Nothing, at all. When you set out to purchase 3,563 comic books with funds provided by the federal government one of the keys words is: economize. Whenever multiple copies of the same comic book were available to us, we always took the one in the worst shape, since that would be the least costly. I can't recall if we had multiple options on this one, but we could not have gotten one in much worst shape. Ours is missing its staples and it looks a lot like a dog has chewed the cover. The paper is so brittle I am loathe to even turn the pages. Handle with care! The comic itself is fascinating. I'm not sure if this is the only comic book in the corpus that is wider than it is tall, but if not it is one of only a very few. 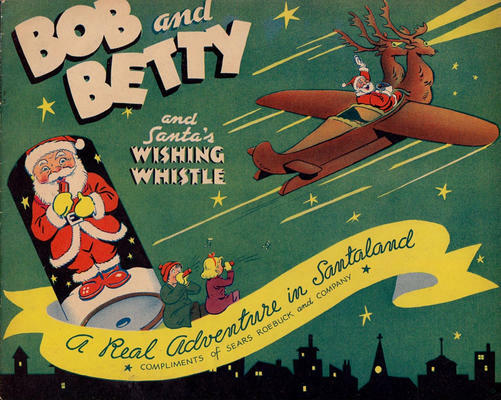 As you can see by the cover, this was a Sears Roebuck give-away comic book from Christmas season 1941. I don't think Bob and Betty were an on-going pair of characters (there was a Betty and Bob series in Catholic Comics, published by Charlton later in the 1940s, but I don't know if they were the same duo). The story is almost exactly as you would picture it - Santa takes a brother and sister to the North Pole for a visit and the get to see how all the toys are made. It is twelve pages long, with no ads and no credits of any kind. There is tiny printing notice on the back. One striking element is that the panels are all numbered, despite the fact that the layouts are extremely traditional. This is a holdover practice in a lot of comics targeted towards very young children in the period. This is one of the most confusing books that we have in the corpus. First of all, the whole "Promotional" section of The Overstreet Price Guide is a little bit confusing to begin with. Let's just stick with the Terry and the Pirates section. There are two entries, one for comic books published by Dell (1939-1953) and one for comic books published by Libby's Radio Premium (1941). The Dell section includes nine different titles, some of which seem, at first glance, to possibly be the same. For instance, they list a "Buster Brown Shoes giveaway (1938)" and a "Shoe Store giveaway" also from 1938. My first reaction was to wonder if those aren't the same thing? But since they are listed with different page counts, so probably they were different things. This book, which got randomly selected into our corpus, is listed by Overstreet as "Popped Wheat Giveaway (1938) - Strip reprints in full color; Caniff-a". 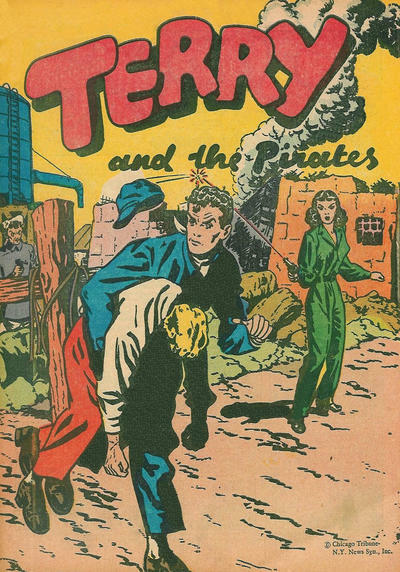 Well, that's what this is - a sixteen-page comic book reprinting Terry and the Pirates in color by Caniff with an ad for Popped Wheat on the back cover. So, good. Right? Not so fast. The GCD lists this comic book as having been published in 1947 - not 1938 - alongside a whole host of other Popped Wheat giveaways. This has a great deal of credence, because, well, those books are advertised on the back of this one. Further, the GCD notes that this wasn't published by Dell, but by a company called Sig Feuchtwanger. Interestingly, the entry itself indicates that there is no publisher listed, but Sig Feuchtwanger is clearly indicated in our copy. So, not Dell. But is it 1938? Well, the copy we have has a 1938 copyright in the indicia. But that is likely because the reprinted strips are from 1938 (and 1939). Given that this comic book contains comic strips from January 1939, it seems impossible to believe that it was published in 1938. So, we have accepted the dating of this as 1947 and agree with the GCD, but we bought our copy from MyComicShop, who list it as appearing in 1938 (they have a couple for sale here, cheap!). Thus, we disagree with two of our three data sources on this one. The confusion extends elsewhere. AbeBooks lists two copies for sale, one dated 1938 and one dated 1947 even though they are clearly the same comic book. Anyway, this is just a taste of the kind of hand-sorting of the data that was necessary to construct our Sampling Frame. There were literally hundreds of comics like this that needed to be reconciled across our three data sources, very few of which then made it into the final corpus. When people used to sometimes ask me why this sampling process was taking so long and why didn't I just leave it all to the RAs, my mind would flash to comics like this one. This week I'll be posting about some of our more recent acquisitions before they head to the shelving unit, so we'll be looking mostly at comics from the 1930s and 1940s. This is one of the least written about periods of the American comic book (at least among scholars), and is also an area that is most prone to generalization and assumption. There's a lot to see here. I will admit that the first thing that caught my attention about this, the final issue of Skyman, was the boy with the Jughead hat. Having written Twelve-Cent Archie, I did some looking into that hat and its design origins in the early-1940s, so finding one here in the late-1940s was enough for me to set the comic book aside. But there is a lot going on here aside from that. "Clean Comics For Everyone" is a heck of a slogan if you know the history of comics reception during this period (Columbia also used that phrase on their flagship title, Big Shot Comics). More than that, however, I was struck by the Ogden Whitney signature right below the title. One of the elements that we are coding for is cover credits. In the 2000s, these are spectacularly common (except among comics targeting young readers), and they are fairly common in the 1990s and even, a bit, in the 1980s. A lot of scholarship presumes them to be absent from the earliest comics, but our corpus isn't really showing that at all. 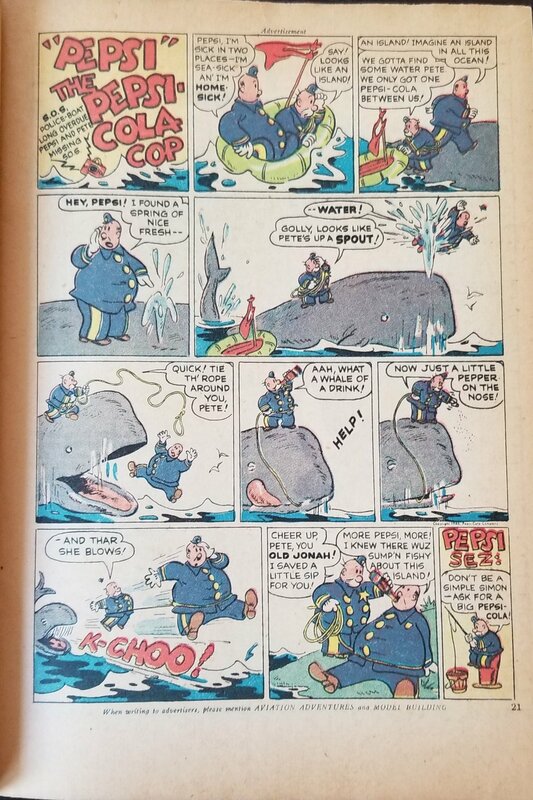 Lev Gleason's comics, for example, mostly have them, and so do a pretty remarkable number of comic books from the 1930s - particularly those with comic strip reprints in them. The Whitney credit here is a little bit more out of place. Whitney, who was inducted into the Eisner Hall of Fame a few years ago, co-created Skyman (a superhero with no powers other than wealth and a weird plane) with Gardner Fox, and his adventures ran in Big Shot Comics beginning in 1940. There were four Skyman special issues in 1941, 1942, 1947 and 1948 (this one). Whitney signed all four covers, and the third issue even has a "By Ogden Whitney" under the title, while this issue lost the "By" but otherwise looks the same. Similarly, all of the interior stories are signed by Whitney with a "By". The GCD doesn't credit him as the writer (they leave it an open question), but Columbia lets him imply he did the whole thing. Maybe he did? In terms of our project, it's not that relevant who wrote the stories, but the fact that an author is assigned to the work is important to us overall. Columbia were a weird publisher that was in business from 1940 to 1949. We have a few issues of Big Shot Comics in the corpus, and a couple of other Columbia strip reprint titles. The publisher was never a big player, as their short life indicates. 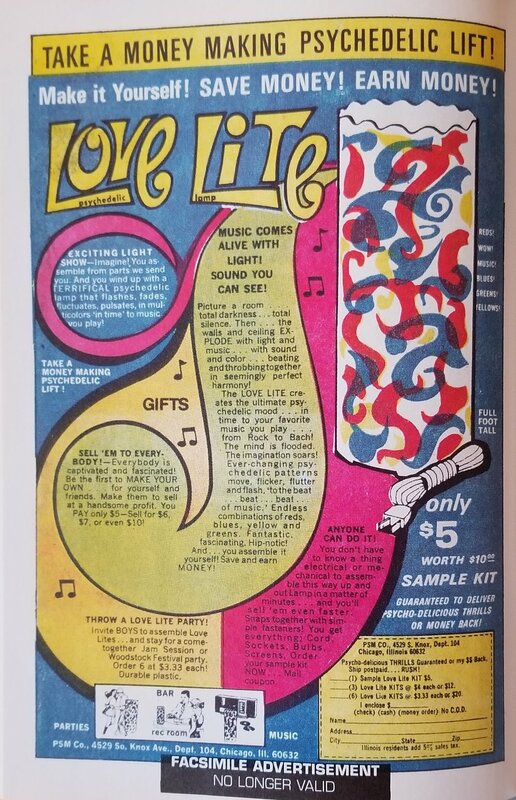 This book is somewhat anomalous for its dearth of ads - it contains only three, an in-house ad for Big Shot Comics on the inside front cover, a Charles Atlas ad on the inside back cover, and an ad for a combination cigarette lighter/flashlight/keychain on the back cover. At the end of 2017, I donated all of my "comic books", by which I mean standard-sized American comic book pamphlets, to Special Collections in the University of Calgary Library to create the beginnings of a comics collection there. Well, almost all of them. The day before the library staff came to pick them up, I rummaged through them and grabbed every comic book that I owned that also appeared in the What Were Comics? corpus. Disappointingly, it actually wasn't that many. It should have been two per cent, but I think it was probably slightly less. In some ways I felt a bit bad about breaking up runs of some series, but, on the other hand, all of the comics in our corpus will someday also be housed in Special Collections - we're just not finished using them yet. American Splendor Windfall was one of a series of American Splendor limited series at Dark Horse and Vertigo in the 1990s and 2000s. They are the only American Splendor comics in our sampling frame because the Overstreet Guide, one of our three datasets, does not index the earlier, more valuable and collectible self-published comics. This is the only American Splendor comic to make it into the corpus, and it is one of a fairly small number of "alternative comics" included. It will stand out in other ways, of course, not the least of which being that there are only a few black-and-white comics in the corpus. This comic book is a weird one for me because it has four artists (Scott A. Gilbert, Josh Neufeld, Joe Sacco, and Frank Stack) and I believe that I've had dinner with three of them (I have never met Stack, and, actually, I never met Harvey Pekar either). My guess is that a lot of people might assume that it will be anomalous in the mid-1990s for being an anthology comic, but having gone through the corpus I'm beginning to think that multi-story titles persist in the comics world a lot longer than generally assumed. So, I guess Fantastic Four are back. I don't pay close enough attention to current superhero comics to really claim to understand why they were gone or what they've been doing. I'm told they were gone for three years, but now they're back. Marvel has rebooted their series and their numbering so much over the years that sorting through all the Fantastic Four comics in the corpus was slightly annoying (I actually purchased a mid-1960s FF by mistake when I should have bought a volume three or four one - I was able to trade it for another book that we needed though, so it all worked out). This comics, #2903 in the corpus, is one of twenty-seven Fantastic Four comics that we own. We have so many of these type of comics: comics where it is difficult to remember why there was a need for a "Special" rather than just a stand-alone issue of Fantastic Four, and comics that don't seem to be much recalled (we got this for less than a dollar, though it originally cost three dollars). The comic begins with a retro style on its first two pages that made me perk up but it then settles into what may well emerge as a generic Marvel house style of the 2000s when all the count is done. An awful lot of overlapping panels in this one, which is one of the more distinctive visual traits of this period. The single book-length story is about Reed Richards having dinner with Dr. Doom. "Little" is probably the most interesting word in our corpus. Forty-six of our comics have the word "Little" in them, beginning in 1948 with Little Audrey #4 and ending in 2013 with My Little Pony: Friendship is Magic #9. Without checking, it may be the single word that occurs most frequently in our titles. But the most interesting thing is the rate of occurrence. Almost all of our "Little" titles come in the first quarter of the corpus. In the 1940s and 1950s, the comics world was replete with them (Little Dot, Playful Little Audrey, Wendy, the Good Little Witch, Little Sad Sack, Little Archie, Hot Stuff, the Little Devil, and, of course, Marge's Little Lulu), but after Harvey ceased publishing this little comics craze was on its last legs. Few things speak as plainly about the audience expectations of the comics world as the transition of this one key term. In short: young readers were the absolute drivers of the comics industry for, well, that's part of what we're looking to determine. Forty years? Fifty? 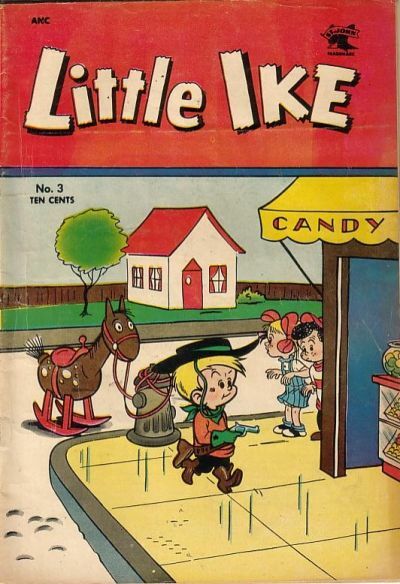 Little Ike was not a successful player in this genre, this is his third of four issues. The comic itself is probably exactly what you'd imagine it to be - a series of short gag stories featuring a mostly child cast. Probably predictably, the next comic in the corpus is Little Iodine #21. The ads in this one are basically the ads of my youth: 100 Piece Toy Soldier Set ("packed in this footlocker! "), Roach Studios iron-in transfers, 204 Revolutionary War Soldiers ("only $2.25"), and, of course, the back page ad for Daisy air rifles. The basic Gold Key line-up for a long, long time in the 1970s. One of the most interesting things about this comic is that it contains two stories and both of them are reprints from the 1950s - specifically from Dell's Lone Rangercomic of that period. So much of the material that was published under the Gold Key banner is reprints that aren't actually marked as such within the comic book itself. Presumably, the feeling was that, over the course of twenty years, the readership of the Lone Ranger had completely changed generationally, and so who would even know the difference? In contradistinction to companies like Marvel and DC that were rabidly marking their reprints as "Collector's Item Classics!!! ", Gold Key (and others) just quietly asked their customers to look the other way. Interestingly, both of the stories in this issues have a certain 1950s feel, which is exactly the phenomenon that we hope to be able to categorize. Gold Key felt old-fashioned in the 1970s because they were old-fashioned, which certainly couldn't have much helped the longevity of the brand. They would stop distributing seven years after this comic book was published. While the topic of comics reprints and consecration has been a big topic for a while (see several of the chapters in the newly released anthology Comics Memory, for example), reprints that aren't announced as reprints are one of the massively understudied hallmarks of the 1960s and 1970s. File this one under "you learn something new every day". Bob Dunn is reasonably well known in the world of comic strips as the cartoonist who took over Jummy Hatlo's They'll Do It Every Time after Hatlo's death in 1963. Dunn won several awards from the National Cartoonists Society at the end of the 1960s. Long before that, however, he produced this book for Western Publishing in 1936. It is a collection of more than fifty single-page gag strips - each one a knock knock joke. They are all in black-and-white, and most are five or six panels since, well, knock knock jokes have five parts (the sixth panel is generally one in which the jokester gets a punch in the nose for telling such a poor joke). The work in here is pretty accurately reflected by the card stock cover - they are minimal, sketchy drawings. Not a lot of detail, not a lot of craft, not a lot of wit. Lots and lots of racist imagery, which (sadly) almost goes without saying for the period. When I looked up Dunn, I found that Maurice Horn's The World Encyclopedia of Cartoons credits him as the inventor of the knock knock joke. That surprised me. Partly because you never really anticipate that anything as simple as a knock knock joke has an "inventor" (though, of course, it would have to), and partly because I would've thought that the knock knock joke would have been around longer than eighty-two years. Looking up the knock knock joke, seems to give some credence to the claim. Wikipedia traces the form back to Macbeth, but, well, please. They cite a couple of examples from before 1936 that are akin to knock knock jokes, but which lack the precise five-part form. Then, all of a sudden, they have a surprisingly large number of examples from... 1936. The most interesting of these, to me, is the fact that Fred Allen complained about the "negative craze" in his 1936 year-in-review broadcast. So it evidently was a new idea. More interestingly, the knock knock joke seems to have faded away and then been revived by Rowan & Martin's Laugh-In, suggesting that the form faded away, and then was revived by a terribly smart tv show with an ironic and retro tone, and that it then stuck in our culture. As the father of a still-young son, I can assure you that knock knock jokes still have currency and still haven't improved very much. Horn called Knock Knock "a million selling book". I have no idea if that's true. It wasn't terribly hard to locate nor was it expensive for a comic book from the 1930s, so it may well have been ubiquitous. The Overstreet Guide refers to this one as "Half comics and half pictures", but that isn't strictly accurate. It's less than half comics, and the rest is mostly a mixture of advertising and model-building instructions. The instructions are really detailed. I'm pretty sure that I could use these to build a really interesting balsa wood airplane if I took this down to my local craft store. Aviation Adventures and Model Building feels a lot more like a magazine with comics than it does a "traditional" comic book. Perhaps it is because the first page isn't a splash page or a story, but an ad. Not just any ad, an ad for Xacto knives. It seems weird to me that there was once a time when Xacto was a company that advertised, but there you have it. The issue is filled with a series of very short comics stories, the most interesting of which is an ongoing series (this issue has the sixth chapter) that literally teaches how to fly: how to use the controls, and so on. I'm not sure who the audience for that would be, and it terrifies me to think that at one time you could learn to fly from what is essentially a children's comic. Unfortunately, you never would've learned to land, since the magazine was cancelled with this issue. The most interesting ad is surely this one, for Pepsi Cola. If you know anything about American soft drink wars, you may know the name Walter Mack, the president of Pepsi who targeted black Americans directly in the 1940s. This ad, featuring Pepsi the Pepsi-Cola Cop, is not an example of that trend, but it may be an example of Pepsi's increasing reliance on niche-marketing during this decade. Definitely something to look into. In our study, Dell's long-running series Four Color has created more than a few problems. On the conceptual level alone, there is some debate as to whether Four Color is actually a series of 1331 issues or is better understood as a series of one-shots. That is not a minor issue for us, because if we do characterize it as a series of one-shots, that completely changes our picture of the creation and cancellation of titles in the early part of the industry. In practice, I have found that some dealers keep all their Four Colors together and others break them up, so that this issue might be filed under B while the previous issue (featuring Smitty) would be under S. We have tended to treat Four Color as a single series to date, but we are open to arguments that we shouldn't be. This particular issue of Four Color, the earliest one in the corpus, raises a whole host of other problems - good problems, the types of problems that this project is precisely designed to capture. Lets' just talk about the most obvious one: Four Color #12 is a "graphic novel". Four Color #12 was released in 1942 to coincide with the release of Walt Disney's fifth animated feature, Bambi. 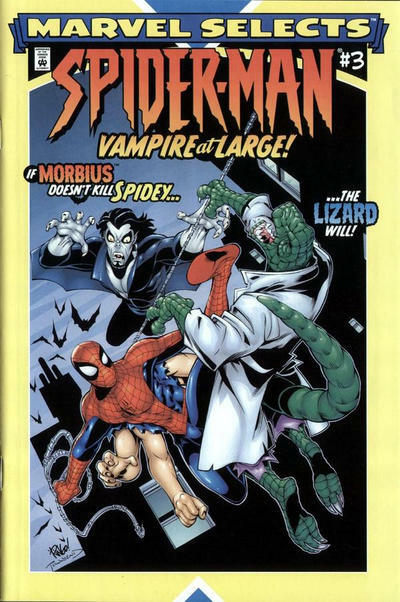 The comic is entirely based on the film, from the modelling of the characters to the plot. It is sixty-eight pages in total (including covers) and sixty-four of those pages consist of a single story. While there is no consensus on the minimum page count of graphic novels (Art Spiegelman's In the Shadow of No Towers is probably the shortest book that is regularly termed a "graphic novel"), it is clear that many "graphic novels" were forty-eight pages, as, for example, Marvel's self-declared Graphic Novels in the early-1980s. By any reasonable standard, then, Four Color #12 is a graphic novel. Of course, there are no reasonable standards for that particular term. A few other items of note: No creator credits, of course. There is no advertising in the comic at all, neither external nor internal, and very little information other than the indicia. The vast majority of the pages are standard six-panel grids, but there are some interesting exceptions later in the book, particularly during the forest fire. It is a strikingly legible book, very easy to follow, which is a function of the intended audience to be sure. One final interesting note is that the copy that we have differs from both versions that are reported in the The Grand Comic Book Database. Their indexed copy gives the title "Four Color Comic" and the number (12) under the Ten Cent price, but ours does not. The GCD has another cover that is like ours, but which costs 15¢ where ours cost a dime.